The koala's looking a wee bit damp! Lovely mid-winter photos. I especially like the wide view of the bush. Seeing a side of the world with which I am not very familiar. I visited my daughter in Sydney ten years ago when she was doing a semester of college at UNSW, but we didn't get vary far into the bush. Lovely flowers! Didn't realize that the koala is that common you could sight them easily? - or is this in a nature park? Marvelous captures for the day, Dianne, as always!! I do love the koala!! Thanks for sharing! Hope you have a great week!! A beautiful representation of our land Dianne. That Koala looks like I fees on a Sunday morning. You're amazing for being able to maintain 2 blogs, Dianne! You are so good at searching out these treasures for us. Yes. We have some wattle starting to bloom too + the odd cluster of blossoms in lingering autumn leaves. Lovely photos. 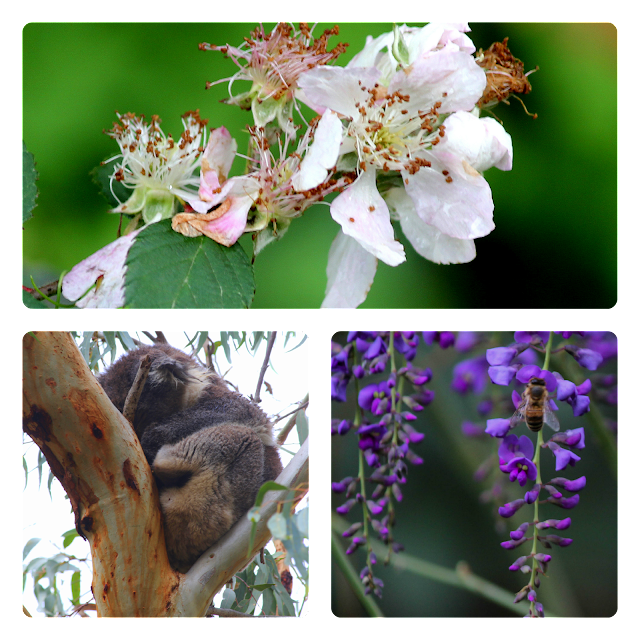 Love the Australian bush and your images of it.